He wanted me to share the way He taught me to explore and dig into the Word, experience Jesus and share His love so others can, too. Have you ever felt that your spiritual life was suffocating or in need of a jolt from God? 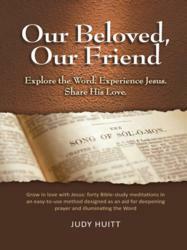 Judy Huitt’s new book “Our Beloved, Our Friend” is a great remedy to spiritual stagnation. A Bible study and devotional guide, the book encourages readers to increase their understanding of God by spending time in His Word and nurturing their relationship with God like their human relationships – through communication and quality time. The forty daily Bible study devotionals included in “Our Beloved, Our Friend” follow what Huitt calls the Pattern, which is a 9-step method taken from Psalm 119. Studying the Bible this way fosters a relationship with Jesus and is designed to be “like breathing,” so readers can take in the life-giving elements of the Word. “Our Beloved, Our Friend” is meant for readers at any point in their relationship with God. By studying the Bible through the lens of the Pattern, they can truly be transformed by spending time with God. They will experience Jesus’ presence and liberating love and in turn be inspired to share His love with others. Available at http://www.amazon.com and http://www.barnesandnoble.com. Judy Huitt is a Bible-study teacher, seminar leader, Christian mentor, and longtime writer of Bible studies and devotions. She graduated from the University of South Carolina with a degree in psychology and minor in religion and has studied theology at the post-graduate level as well. She has served as a leader in her church and community, held various local and state-wide ministry positions, including being a state women’s chair for a Billy Graham Crusade and an Anne Graham Lotz “Just Give Me Jesus” event. She has also been a teaching leader for Bible Study Fellowship. She lives in Rock Hill, South Carolina, with her husband Sig. They have two children and four grandchildren.